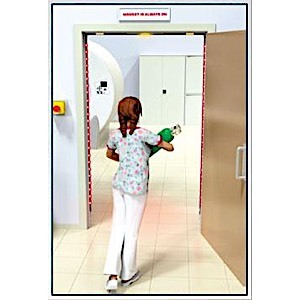 FerrAlert Halo II Detection system: Guards at the entrance into the MRI exam room, providing the most precise and reliable detection and prevention of ferromagnetic threats from entering Zone IV. FerrAlert™ HALO II provides significant assistance in the prevention of serious injury to patients and staff or equipment damage. Our New Visual Advanced Warning Technology alerts on the approach of ferromagnetic threats to Zone IV, well before the portal is reached. The greater the threat, the further away the warning is activated. GREEN – Go YELLOW – Warning RED – STOP! NEW - INTELLIGENT VISUAL ADVANCED WARNING alerts on the approach of ferromagnetic threats to Zone IV, well before the portal is reached. The greater the threat, the further away the warning is activated. The audio alarm is activated only at the threshold if advanced visual warning was ignored. Ferrous objects not approaching the entrance to Zone IV do not trigger a warning. INSTANTLY PINPOINTS LOCATION OF FERROMAGNETIC OBJECT allowing the Technologist to quickly and easily identify all ferromagnetic threats – NO invasive pat-down or handheld detectors required. ALARM STATUS IS ALWAYS VISIBLE FROM BOTH inside and outside THE MRI ROOM unlike all other detectors, ONLY FerrAlert™ allows the Technologist full control of the MRI room at all times. ACR and The Joint Commission require control of Zone IV at all times! PATENTED TECHNOLOGY SUPPRESSES FALSE WARNINGS while providing the HIGHEST SENSITIVITY to ferromagnetic threats. This technological advancement reduces alarm fatigue and increasing throughput. The use of 24 sensors ensures uniform sensitivity and detection reliability from head to toe.